Cisco 7960G IP Phone (CP-7960G) is a key offering in the IP Phone portfolio, is a full-featured IP phone primarily for manager and executive needs. It provides six programmable line/feature buttons and four interactive soft keys that guide a user through call features and functions. Audio controls for duplex speakerphone, handset and headset. 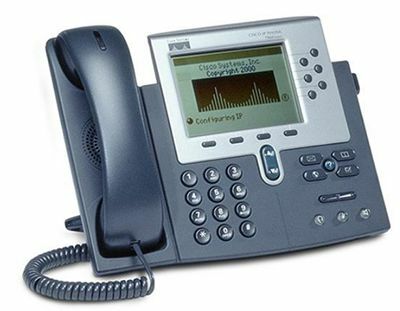 The Cisco Unified IP Phone 7960G also features a large, pixel-based LCD display. The display provides features such as date and time, calling party name, calling party number, and digits dialed. The graphic capability of the display allows for the inclusion of such features as XML (Extensible Markup Language) and future features. Cisco 7960G Unified IP Phone is dynamic and designed to grow with system capabilities. Features will keep pace with new changes via software updates to the phone's flash memory. The phone provides many accessibility methods according to user preference. Various methods or paths include buttons, softkeys, a navigation key, and direct access with the use of corresponding "ghost" digits.